Charge 2 Apple iPhones at the same time. Can charge 1 iPad using the same charger. Can charge 2 iTouch's at the same time. Can charge 2 iPod's at the same time. 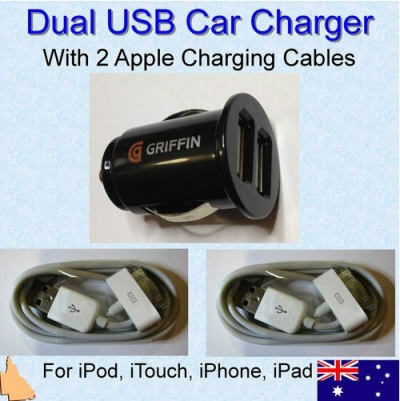 USB sockets provides 2 amps total allowing fast charging for 2 iPhones. Power GPS, MP3 player, 2 iTouch, 1 iPad, some 5 volt tablets. Cables 1 metre in length.